Il Best Western BK's Pioneer Motor Lodge è situato nel centro di Auckland. L'hotel è vicino alle principali attrazioni turistiche. Approfittate tutto l'anno del miglior prezzo garantito e di offerte esclusive. Had a great one night stay at this Best Western Hotel. Very impressed. Friendly staff. Lovely, spacious room. Great bathroom with complimentary toiletries. Coffee and tea making facilities. Very comfortable bed. Have no hesitation in staying there again and recommending to others. Have already recommended it. The motel is located close to a busy road which can be noisy at times. I was given a room at the far end of the parking on the ground floor where it was very quiet. I found the people at reception quite helpful. I chose the motel because of its location (close to the airport) and the fact it had a free airport shuttle service. My room was huge and had all I expected although I found the fridge rather tiny. The air conditioning unit didn't appear to be working properly but as I was out most of the day it wasn't such a problem. I wouldn't have stayed the two nights there if I had realised that there was nothing interesting around (for me that is). I do not drive and had to catch a taxi (became expensive) a few times to go to various shopping centres to pass the days waiting to catch my flight out. Its a great place to stay if transitting or waiting to catch a flight within a day or two. The customer service at this hotel is top notch! Free airport shuttle service from hotel staff is great. When it was raining and we were going to walk somewhere nearby, the hotel staff gave us a ride there and loaned us their umbrella for the short walk back. That's what I call going the extra mile! The bed was amazingly comfortable and the shower had the best water pressure I've ever experienced at a hotel. "Great option for airport motel." The shuttle picked us up from Gate 11 at the international terminal at Auckland airport and we were greeted by a very friendly driver, who I think might be one of the owners. Check in was easy and quick. Our room was really nice - very spacious with a modern, clean bathroom. There was a small kitchenette with kettle, microwave, dishes and cutlery and a table and two chairs for sitting. The on-site laundry was much appreciated, especially as there was no charge for this service. As is typical with airport accommodation, the location is in a fairly industrial and in an out of the way area, however there are options with a few restaurants and a small grocery and liquor store. The Villa Maria winery is a fairly short walk away and they offer tastings and a cafe. We had no problems sleeping; air conditioning has been installed, but we didn't need it with the overhead fan. We booked our shuttle for 0430 a.m. and the lovely woman who worked overnight was ready and waiting for us. I would definitely recommend this motel and found it to be in line with the cost of most airport accommodation. Just had one night here but very clean and comfortable. Little kitchenette with hob and fridge. Good shower. Need earplugs as very near motorway and main road. We were not disturbed by other people coming and going - maybe we were lucky. Very helpful lady on reception who gave us good local advice for a walk. We stayed a night at the beginning and end of our trip overseas. We found the overall experience for a transit hotel very comfortable and smooth. We used the free shuttle service which came out specially for us even after midnight. Check in service was simple and quick with no queues at reception like in a larger hotel. We ordered breakfast the night before and it was delivered to our room at the time we chose. Comfortable beds. Have stayed at the Jet Park before but preferred this place as the service is more personal and relaxed. I stayed here on my first night in NZ. I wanted somewhere close to the airport and car rental company and this fit the bill. The staff at reception were friendly and helpful. Check in was quick. The room was clean, modern and well equipped. There is a small convenience store a few minutes away, plus some basic restaurants where you can eat or buy takeaway. All the airport motels are within a few metres, so there is a lot of choice. Loses a star because it is expensive for a motel. 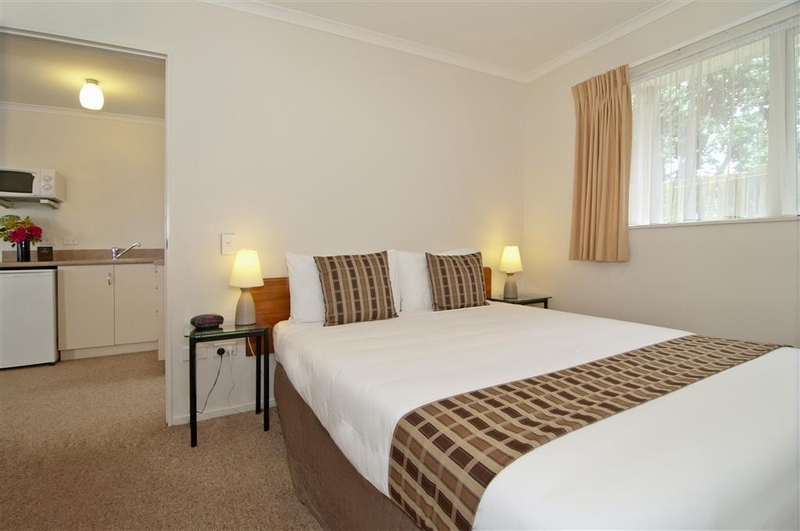 A perfect close stay conveniently located only 5 mins from the Auckland airport. Rooms are well equipped and clean. Only negative was that the walls and ceiling are paper thin. Local area is loud with hoons in cars and police sirens. "Really convenient close to airport"
Hotel is a 5 minute ride from Auckland airport, a courtesy pick up and drop off is available. Lovely clean room, comfy bed and good sized bathroom. Peaceful and quiet. Breakfast brought to your room. Close to small shopping precinct and a couple of restaurants. "Realy good for the price." My family of 4 adults stayed in a very comfortable room. Staff were realy helpfull and friendly. We had a great breakfast suplied. They dropped us off at the near by Campervan hire firm for no charge. Close to the Auckland Airport. Would not go anywhere else if needing that location. I very rarely give a perfect 5. They nearly got one. "Best for comfort, price and service"
beautiful large rooms, fans, good beds, free Guest Laundry, BUT dryer rattled loudly at night... Customer service excellent....free shuttle to airport.. very quick and courteous. price for large 1 sep bedroom and 2 singles was reasonable.. upstairs on right for breeze through back windows.. All staff great..
Good value, helpful staff, clean rooms! Airport pick up was quick and Manager was informative about local attractions.Will use this property again. Only negative was limited selection of Tv channels. Needs Sky Tv! Situated close to the Auckland international airport this hotel satisfies the traveller arriving late then leaving early. This also means it is on a major arterial road with traffic lights nearby. Not a restful sleep due to trucks braking, sirens etc. I stayed here for three nights whilst in Auckland for a few days. The room was lovely. A really comfy bed, a sitting room area and kitchenette. The bathroom was also large and had a nice bath. I was very pleasantly surprised, by the cleanliness and comfort of the place. I had a room at the back of the property which was nice and quiet and bright. The staff were all friendly and accomodating. As a repeat stayer, love this place, excellent value, super clean, makes everything easy. Any time I need to stay in Auckland, particularly near the airport, I would always (without exception) choose the BK Best Western. We stayed here on our first night in New Zealand. It is very close to the airport and had free parking for our rental car. Our room was very clean and comfortable. Everyone at the front desk were very helpful especially since we were dealing with a lost suitcase. We were glad we stayed here for our first night and were able to get a good nights rest before driving the next day. We would definitely stay here again. We have stayed here several times when needing to be close to the airport, and as always, we received friendly efficient service and our room was clean and comfortable. We particularly appreciate the airport shuttle service, which makes it extremely good value. "Clean, modern rooms, good service/reception, convenient to airport and shuttle provided." We stayed here two days, prior to departure from the Auckland Airport. Reception and checkout were friendly and efficient. Our room was very clean and modern, especially the bathroom. Parking is free, but the hotel was full and the parking spots limited. We returned our rental car a day early, and took the express bus into Auckland for the day; the hotel shuttle picked us up in the evening, then returned us to the airport the next day. There is no onsite restaurant, but a kitchenette was in the room, and there are several restaurants within walking distance. Overall, the is a very good facility, and very functional. We stayed at this hotel for one night and it served its purpose since we were leaving the next day and it was close to the airport. Somehow there was not a very secure feeling about the place. I could hear voices outside when individuals passed by. The room was equipped with a fridge and utensils. The front desk representative secured a room very quickly for us even though we arrived earlier than the check in time. There were no elevators and luggage would have to be carried up staircases. I asked if we could get a room on the ground floor to avoid hauling luggage around. They willingly changed our rooms for us. Yea, it is close to the airport and serviced by the Yellow Bus, but I would try somewhere else next time. I waited until after I had stayed a 6+ NZ "motor lodges" before writing to get an idea of comparisons. Clean, friendly, but a little dark and cramped inside. Internet was non-existent - would not stay connected on either laptop or either phone. Overall OK but not a 5 - it's a stretch for a 4..
"Worst internet in a commercial establishment - no door locks either!" The hotel is average. It is not unclean. But two things are terrible. First of all, the wifi is the perhaps the worst I have experienced in a hotel in years. This is a serious problem as I had work to do while here. I ended up having to go to another nearby hotel and explain the problem and use theirs. Second, the door has no secondary lock so you cannot lock the door while you are inside. As there is also a visible gap around the door the security does not feel good. You are only a few meters from a major road here - in not the best of neighborhoods - so it is not comforting. There are other major chain hotels around here. I suggest opting for one of those. "Two and a half stars"
The motel is right on the highway. There is a lot of traffic noise. There is no AC. You choose either to open the window, and get some air circulation, and endure the noise. The ceiling is low. If yo turn on the ceiling fan, be sure you don't raise your hand. We have one queen bad. Our substantial room rate did not include breakfast. The furniture are simple and austere. They put us on the second floor. No elevators, and no help with the luggage. Not worth what I paid for. There are plenty better accommodations around. "Great airport and campervan location"
Great location for the airport and if collecting/ dropping off campervan. The motel offers free airport drop off. Rooms were spacious and lovely and clean. Staff are friendly. Good in room amenities. Only reason have marked it as a 4 and not a 5 is it was a little noisy Times but this was mainly due to having a noisy person above us. Would recommend staying. Room was good, location ok & near restaurants etc.On main Road so some road noise.a very popular motel judging by amount of vehicles in car park.Shuttle to/from airport at regular intervals.Book ahead. "Perfect beginning and end of the holiday!" My family and I (seven in total) stayed here the night before our flight to Australia and the night we returned as well. My husband and I had our own room which was perfectly set up. My other 5 members were all in a 2 bedroom room, which they say was great. Our beds were a little harder than we would like, but we fell asleep pretty fast on our returning stay. My aunt left a bag behind the counter while we were away for two weeks which was very helpful for her and we had great shuttle service to and from the airport. We left very early at 4.30am and 5.00am, but all went according to plan. I also had great communication when booking these rooms with the receptionist over the phone. Because there were so many of us in our group, I didn't want to make any old booking online and guess how many beds would be in each room. I had great service and would definitely recommend this accommodation to anyone who is needing a place to stay close to the airport :) 24 hour reception as well which is super handy! Also, there is a very friendly cat who is happy to welcome you on arrival! I've stayed here a couple of times, I first arrived late and was picked up by the shuttle bus quickly and was checked in and settled within the hour. The room clean and everything as I expected. The bed was big and comfy and I slept well. The shuttle bus actually dropped me of to the hire care place as it was close by. That was so helpful. The next time I stayed it was just as good, I really recommend this hotel. "Perfect stay from a late flight"
We arrived later than expected at 11 pm and it was no trouble for someone to pick us up from the hotel. A quick check in, a great shower and were in bed within the hour. The room was very clean , quiet and very spacious. Although we had our own brekkie you could order it. We walked to our car rental from there with no problems. They have a great deal there as well. If you stay there one night you can leave your car in the parking lot for 10 days! We chose this hotel for its proximity to the airport and value for money. The Motor Lodge is close to the airport but sits next to a busy motorway. The windows are not double glazed so it was quite noisy at night. Merging into traffic can be an issue on the mornings, so I took the long route to get to my destination. The units are clean and well appointed, but the blown light bulb I left on the bench with a note was not replaced on subsequent days. My biggest issue with this motel was the inability to maintain the shower temperature. I don't think there is mains water pressure as in the middle of a hot shower, the water would turn cold. I find that unacceptable in this modern age. This well kept hotel is a 10 drive from the airport which is wonderful, especially with the free airport shuttle. Coming in after midnight a friendly attendant picked us up, carried our bags upstairs...did it all. After a good nights sleep we were again shuttled back to the airport to pick up a car. Would recommend for anyone. "Great value. Would use again"
"Great value will use again"
Perfect overnight stop close to the airport. The free 24h shuttle was a bonus when I needed it at 4am. Large clean rooms with small kitchen area. Large bathroom. There is plenty of parking for those with cars. Stayed in two bedroom suite with a group of friends before an international flight. Our ‘Senior's Australasian' rate included airport shuttle on departure and return and free car park for 10days. We were able to leave our vehicle for an additional 2 days for a small charge. Staff were very helpful during the booking process and the suite was comfortable and more than met our needs for a one night stay. Places to eat within walking distance, surprisingly little traffic/activity noise given the location. Will recommend to others. Functional near the AKL airport sleepover prior to our next morning flight out. BK did the job at a price....it's not not cheap for what it is...150 bucks approx. But, Auckland's the dearest innit...maybe Queenstown is higher? Welcome back to NZ! Arrived at property 1130pm. Left on the 1000h shuttle next morning. Shuttle to and from arrival / departure areas went ok much appreciated. Bed and shower both good. Really smelly carpet in room ponged badly upon entering took our breath away. Time to replace? Maybe another good commercial cleaning can't do it...it was well worn and stained upon closer examination in daylight! Sadly room heater was broken ... and it was COLD (compared to last port of HNL) and we had to open a few windows. Wots worse? Can't breathe or it's COLD? Some staff friendly, others going through the motions this was an okay overall experience and we would give em another chance next time we find ourselves needing 'near AKL accommodation. 3 circles barely. I have been staying at this motel for around 10 years, on average 4 times per year. The staff go out of their way to accommodate me on my visits, the room is always exceptionally clean, and the staff are always friendly and helpful. Highly recommend this motel, especially if you are flying out of the country, as they provide free car storage and complimentary shuttle to and from airport. Well done Rukhi and Ramesh. We stayed here twice when flying through Auckland. The first time we used the airport shuttle for free. The second time we had a car. They have capped wifi, which was really annoying. It would also log you out of the wifi constantly. We spent three weeks in NZ and only in Te Anua and here had capped wifi....Why in Auckland does anywhere still have capped wifi? Also, it's pretty much a food dessert. So if you don't have wheels, you can walk about 10 minutes to a little bakery...but that's about it. Perfectly adequate for a nights stay. We stayed before & on return from overseas trip & as title says the hotel was ‘perfectly adequate'. Not luxurious but everything you need in a room & spotlessly clean. Great shower too. Free shuttle to & from airport. Free wifi but kept dropping out & you had to enter a code & password each time to log in. Good for the price. Close walk to several restaurants. Would stay again. "Great motel close to airport"
We stayed here before a early morning flight. The motel is close to the airport and the room was quiet and clean. The shuttle to/from the airport was efficient and on-time. We left our car there for the 10 days. When we returned the car had a flat battery. The staff (Joseph) were amazing at helping us get it going again and even following us for a few kms to check we were ok. Also liked that the owner was looking after cats that had been abandoned at his motel/the area. Will definitively stay again and cannot recommend enough!!!! "Lovely motel but....... who forgot the wake up call?" Everything was lovely except that the alarm clock in the room didn't work. Check in perfect Room lovely - the heater could have been a little bigger Shower, spa excellent Wake up call at 0315 - still waiting. We confirmed it twice on arrival at reception and it was written down Night Manager didn't get told about it Alarm in unit didn't work Thankfully I had set a second alarm for 10- minutes later - phew! Yes we did get to the airport close to time . It is a question of trust that management will get it right every time. "Excellent in every regard - friendliness of all staff, clean, close to airport"
Really nice clean motel, family-run with top-quality staff and excellent service close to the airport. I could leave my car in their free parking whilst I was away but only checked in when I needed a bed. They have a very efficient shuttle service, both drivers were great and the evening driver (an employee) went the extra mile. I arrived in on a late domestic flight and hadn't eaten. He kindly took me to KFC (very little open at that hour and KFC were only drive-by after 10 pm until midnight). This morning a lovely woman came with breakfast at the exact time I asked. I totally recommend this motel. They really understand service and friendliness. I'll be back. "BW Motel Saved Us in our Hour of Need"
We'd arrived late in Auckland on Friday 13th April to pick up a Britz camper van for a 10-trip. It turned out to be the start of school holidays, so Auckland traffic was horrific and when we arrived at Britz at 440pm, we were rudely informed that they were now closed and to come back tomorrow. Despite pleading for them to let us have the van we had rented, as we had nowhere else to go, we were subject to the worst customer service I have ever witnessed (Britz review to follow). So we walked folornly up the road to find the welcome reception of the Best Western, who had rooms for the night and a not too unreasonable price. Our room was huge, with a seperate diner/lounge (including another single bed), a large double room, and a massive bathroom with jacuzzi! We happened to have a pot of homemade Singapore Chicken curry with us (long story), so wandered down the road about 0.75km to a grocery store, with adjacent liquor store and bar. Perfect. We had a very good nights sleep. We'd ordered breakfast, to fortify us before our morning battle with Britz Camper vans, and were wondering where it was served, when there was a knock at the door. It was one of the staff with a huge tray of cooked breakfast. A great start to our day!! the room was clean, and well equipped (fridge, microwave, TV etc), location perfect for the airport, and camper van depot. All in all, very good. We needed somewhere to stay for the last couple of nights before flying back to the UK. This was the ideal location, just a few minutes away from the airport and rental car returns. Our apartment was roomy, clean and comfortable, although a little noise from neighbouring apartments. A lounge/ kitchen with a small bed and a separate bedroom with a double bed. Shower room with toilet and wash basin. Reception welcoming, WiFi available but you have to get a code for each device and there is a limit to how much you can use. A guest laundry is available free, washing machine and tumble dryer, you just have to supply the wash powder. Restaurants not too far away if you don't want to use the microwave and hob provided. Also provided is a free transfer service to the airport. very happy with the service , the room , friendly staff, dropped us off at airport at 4.30am no problem, when we got back rung them they were there in 5 mins to pick us up, left car there for 10 days free of charge, totally awesome people. lovely bed just awesome recommend to all , defintely stay again. "Surprisingly quiet for this close to the airport"
We checked in late evening for an early international flight in the morning. Very friendly and helpful staff at check in, offered to help carry our bags upstairs. Room was clean and plenty of room for a family of 5. It was surprisingly quiet for how close it is to the main road and the airport, couldn't hear any outside noise at all. We got free parking for 2 cars for 8 days. We used the free shuttle service to and from the airport, it was very prompt and the driver super friendly. We would definitely stay here again if travelling from Auckland International Airport and would recommend it to others. We stayed for 4 nights and the staff were so nice. The room had a corner spa that the kids loved and the room was very clean. Plenty of tea,coffee, milk etc. Free transportation to and from the airport and even drove us to the car rental company. Thank you for a wonderful stay. Highly recommended! "When flying out of Auckland--good choice"
The room we had at this motor lodge was large with 2 doubles and a single. One of the doubles was in a separate room which was cool enough to sleep in. Only some rooms in the motor lodge are equipped with air conditioning. However, the kitchen was well-serviced (even a hot plate) and we enjoyed the spa tub after a day of walking around Auckland's CBD. The airport shuttle is on time and a great plus to staying at this establishment. All staff were kind, respectful and helpful. 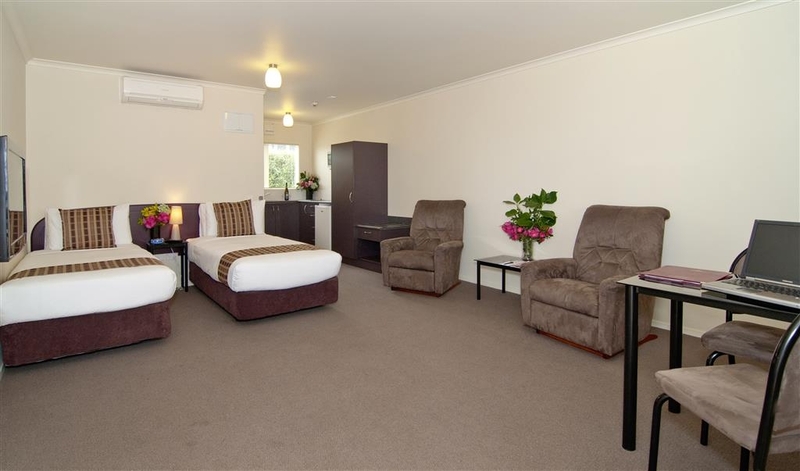 "Best place to stay near Auckland Airport - for decades"
We have stayed at Best Western for many years, every time when we have traveled to or from Auckland International Airport. The units are spacious and comfortable. The welcome is warm and efficient. The service of picking us up from or delivering us to the airport, often at the most impossible times of the night, is very handy. The car parking allowance for when we travel overseas and leave our car with Best Western is generous. We stayed in this hotel overnight before catching an early flight. The free airport transfer was very good and the driver was extreme helpful. However, we are extremely unhappy with the internet connection. We were given 2 wifi vouchers with separate user names and password and limit of 500MB. However, whilst you cannot use the same details to log onto both the 2 iPhones and and iPad. Furthermore, the connection kept cutting off. To reconnect, you have to repeatedly enter the log on details again, then after several attempts and managed to send a few emails, we got messages that we have exceeded our limited and were unable to log on again! Its really rubbish!!! Very accessible from the Airport, Hotel offers free shuttle to and from the Airport, Staff we super friendly, would deffo stay again. Excellent value for money. Well maintained frontage with ample parking. "Convenient with free shuttle service"
Stayed overnight here with my parents the night that we flew in. They offer a free shuttle service to and from the airport which is always great. Customer service was excellent and the person who was at the front desk was very friendly and helpful. Room was comfortable and spacious (we stayed in one with a queen bed and two twin beds). "Clean with free airport transfers"
As with most airport hotels we only stayed one night on our way to an early flight so the free airport transfer was important. Our room was spacious and clean and despite being on the main road we slept well. We didn't find much in the way of dining options nearby (although there was an indian restaurant). The wifi was free for one device but it didn't really work very well. Another hotel had messed up our booking so we walked (with all of our luggage) to BW. They accommodated right away. We got a suite that was perfect! They gave us restaurant suggestions and even gave us suggestions of what we could do for our stay. They had free laundry and shuttle service. They took us to a nearby activity and picked us up at a different location when it was time for us to go to the airport. They even brought our luggage for us! They were helpful and friendly throughout our stay. We appreciate it so much since we had a terrible experience with out flights! "No air conditioning in most of the rooms"
The paperwork I brought with me said we had a room with air conditioning. On arrival we were told that we had a kitchenette (and this was on our paperwork although I had not requested it); And that the kitchenettes do not have air conditioning; and that they were full and could not give us a room with a/c. It was hot and humid while in Auckland in Feb 2018. We were traveling with family who stayed in a different room on bottom floor at other end of building, they did not have air conditioning. The long building by the office does not seem to have a/c or heat. There is another smaller building that apparently does have a/c according to them. Be Careful if you are there in Hot/Humid weather. They did provide 2 room fans and the ceiling fan. We were hot and not comfortable the last night of our trip. They are very close to the airport and had reasonable prices. This place was very close to the airport and a free 24 hour shuttle ran to and from both domestic and international terminals. When checking in you just need to make sure you arrange for a shuttle time. They only have limited slots so you need to get in there quick! Sadly the walls are paper thin and we could hear everything from the rooms around us. We pretty much had only a couple of hours sleep due to this. This place is easy to find and plenty of parking too. A decent night kip with tv in the room. The bathroom is a good size with lovely shower. This hotel is ideal for the overnight stop Nearby pub grub at The Post Office. "Comfortable, Good Customer Service, Close to airport"
Booked here for one night as we had a late flight from Australia. Airport Transfers were free and easy to organise with a phone at the Auckland Airport. The rooms themselves are tidy enough (standard motel type) bed was actually very comfortable. Bathroom clean, but a shower without a screen made the bathroom a little wet. My only complaint was that you could hear other guests wheeling their luggage at all hours of the night. Aside from that, very convenient. Easy to organise transfers. Would recommend to anyone looking for a quick stop over before moving on elsewhere in New Zealand. Stayed here just for one night to attend a concert at Villa Maria Winery. Good basic room with kitchenette and large bathroom. Clean and tidy, with comfortable bed, and in quiet area. On-site parking. Would stay again if attending another concert, easy walking distance to Villa Maria. "Good place for airport stopover"
We stayed here two nights within a few days of each other. When we arrived at international arrivals (after 36 hours straight travelling), at approx. 10AM we got a rather rude response. The immediate response was that check in was 2PM and did we want our luggage picked up! I said no, we required our luggage and ourselves picked up. We understood there may be a wait but had nowhere to go and we too tired to do anything else. The free shuttle did arrive and the driver was very pleasant. We arrived at the motel, after dropping a guest at domestic departures, and lo and behold our room was ready and the reception was quite warm. We know that rooms are not always ready, and we fully understand we may have to wait, but instead of “check-in is at 2PM” one could say “you are welcome to come over and we will try to have your room ready as soon as possible”. Having said that, the reception is very small and there is not room for even a single chair so if the room were not ready I am not sure what one would do! In spite of the initial turn off, everything after that was terrific. The unit was spotless, bedding excellent, lots of room. One night we had a one bedroom with a queen bed and the living room had a twin. There was a nice sized shower in the bathroom. The second night we had a twin room. Both were very large, had a table and chairs, kitchenette and two recliner chairs. The hotel offers free park and fly for 10 nights – we did not use this service but seems to a very good alternative to other options. We were very happy with the place, but have to say that the initial phone conversation had us very concerned and it was completely unnecessary! Honesty, the first words to anyone with a North American accent arriving at international terminal (who would almost ways have been travelling for many, many hours) should not be so negative. The motel offers free WIFI (500 mg. but you can get another log in) but it is very sporadic and very unreliable. Booked a room online for 1xQueen. On arrival the room had 1xQueen in lounge and a single bed also a seperate bedroom with 1xQueen bed. Room was very hot no air-con. Pulled sheets back on the bed in the bedroom and found sheets had previous visitors hair all over the sheets, absolutley disgusted. Spoke to reception, they apologised stating the housekeeper had only been with them a week, not really a good enough excuse it should never had happened. They changed the sheets for new ones. We were unfortunatly committed to stay. Will not stay here again. had to have two fans and the room ceiling fan working continually as the room was stuffy and hot. Yes its convenient to Airport but that is the only thing in its favour. "Airport hotel in a reasonable location"
I have mixed feelings about this hotel. I booked this hotel because it claimed to be an airport hotel with free transfers that are available 24/7. Our flight arrived in close to midnight as I had forewarned the hotel. I then tried ringing the hotel repeatedly for the free shuttle. No one answered despite the numerous attempts at contact that I made. I eventually gave up and we had to catch a taxi. Due to roadworks and the poorly signposted entrance, the poor taxi driver then drove around for close to 1/2 an hour without charging us any extra, to reach the entrance to the hotel despite the fact that the hotel is reportedly only 4 minutes away. When we arrived and I mentioned this to the guy at reception, he did not respond. Our experience after that however was very favourable. The sleep quality, despite the location on a main road, was good. The beds were comfortable. The lady, the next morning (who I assume was the owner) was friendly, obliging and very kind as was the Samoan gentleman who drove the shuttle bus to the airport. The cleaning ladies were all very helpful and patient. I would still recommend this hotel as it was close to the airport and pretty good value. We chose this hotel as it was close to the airport, and we didn't intend going into the city. It was very clean and spacious with enough kitchen equipment to make a meal if you were so inclined! Beds were comfortable and the shuttle to and from the airport a bonus. Not much in the vicinity, though there are two restaurants, a bakery, pharmacy and convenience store. The so big and clean , comfortable and the shower big space but had an issue was not have much pressure the water run really slow. About parking you have to find you own because doesn't have to number of the room on the park. I think made it really hard. "Super handy Airport and City gateway hotel"
I've stayed here at least 8 times because it is close to the airport and has a free shuttle. I kept coming back because the staff was so wonderful but this time I was disappointed. I checked in around 9pm and had to wait in the office while different staff kept coming in and out deciding who would actually check me in. I have worked in the hospitality industry for 9+ years and this didn't sit well with me. The check in was quick and impersonal. I asked if there were food places that delivered and was just told to look at the brochures. I was handed a room key and vaguely pointed in the direction of my room. The room was tidy, beds made nice. All in all it is a nice place but slightly disappointed with the brush off service I received upon check in. This could be chalked up to an off day with the staff but having such wonderful experiences here in the past I expected more. "Should've listened to the negative reviews"
After reading the reviews (some positive, some negative)on this motel, I decided since we only needed one night close to the airport that I would take a chance. The free shuttle was another reason I thought it would be worth it. It wasn't. Positives: I contacted the hotel by email prior to our trip for instructions on how to meet the shuttle. The response from Diana was very polite, prompt and helpful. The shuttle picked us up at the airport and dropped us off at the motel. It was a short drive and the shuttle was easy to identify. Negatives: Front desk staff- After 15 hrs on the plane, we were ready for a hot meal and shower. We asked the man at the front desk if there was food within walking distance and if we could exchange money anywhere nearby since we weren't picking up our rental car until the next day. He was annoyed that we were asking anything. He was not friendly, not helpful and acted annoyed the entire time he checked us into our room. The room-no A/C (it was hot and stuffy). I knew there wasn't air conditioning, but I expected the windows to be sufficient in airing out the room. Well, there are no screens on any window and if the window was open, anybody could've climbed in the window. Based on the sign right outside our room door warning that everything needed to be locked and out-of-sight to prevent crime, we were uncomfortable leaving the window open. The room had a very strong smell of antiseptic cleaner. The bathroom was very clean, but the rest of the room was dingy and the antiseptic smell was very overpowering. I've learned my lesson. This motel was not as cheap as it should be-not worth the $123 (U.S.) we paid. Even though it was only one night...it would've been worth it to look harder and pay more. "Comfortable and close to the airport"
Our family of 4 recently stayed twice at BK's Motor Lodge. We selected this accommodation because it was close to the Airport and we had flown in on one date and then out on another and both times had flights that required us to be close to the airport ahead of staying in Auckland central. We were both stays in the same room which was upstairs and had the master suite in a bedroom and then a lounge area with small kitchenette and two single beds in this area as well. The facilities were all clean and parking was not allocated but easy to get a car bay. It was unseasonably warm both dates we stayed and these rooms have no air conditioning. They have electric heaters for winter but nothing for hotter weather. We asked at reception and they sent us up a pedestal fan which certainly helped. There was also a nice breeze it you sat out on the landing. The staff were happy to assist with our request and we thought this was good value for money. Even though there were major road works happening, we did not experience a noise problem and it was very convenient for the airport access. We would stay here again. Chose this motor lodge as it was convenient to our campervan pickup location. Check in was good, the room was average for the price we were charged, and the checkout was very good. Rooms didn't seem very well insulated as there was quite a bit of traffic noise. Overall, a nice place to stay close to restaurants and the local shopping village. "Good Place to Stay for Airport Hotel"
On a trip to New Zealand in October, we stayed one night at Best Western BK's Pioneer Motor Lodge as we had an early morning flight the following morning. Check-in was pleasant and easy. Once we were checked in and had unloaded our rental car, we took it back to the car rental agency and the hotel's shuttle bus picked us up from there and brought us back to the hotel, which was much appreciated. They, of course, also took us to the airport the following morning for our flight. The room was quite large, comfortable and clean. My only complaint would be that our particular room was at the top of the stairs and the light from the large front window was seriously blocked by the fact that the laundry room was directly across the walkway, making the room feel much darker than it should have. We did like that there were at least a couple of restaurants within easy walking distance of the hotel, as we did not want to go into Auckland that night. Otherwise, no complaints at all, and would recommend this property. Very close to the airport by shuttle. Really appreciated the shuttle service to and from airport before and after very long flights. The manager and employees were very friendly and helpful. The hotel room was clean and a good value for the price. "Like sleeping on a building site"
I am not sure how this motel gets 5 stars. We stayed here twice having pre booked on their web site for $189 a night we later found expedia doing it for $169! We stayed because we could park our car here free for the week. Any way the first night we stayed we had a room at the end of the block from the office and it was basic but OK. Quite large and clean. Be aware that major road works are going on right at the front of the building as when we returned from our trip at 11.30pm we had a room on the upper floor close to reception and although we had ear plugs were woken all night with trucks revving and engine noise. It was a nightmare. Shuttle was good and on our return we rang from the free phone at the information centre at the airport opposite the rental car booths and waited just 10 minutes. We will not be repeating the experience! We stayed two nights on arriving in Auckland at the B.W. BK from the U.S. The reception was very friendly and helpful. We arrived at night and the shuttle was prompt and the check-in smooth. The room, while not fancy, was clean and very comfortable. The shuttle dropped us off at the car rental location rather than the airport which was nice. I would definitely stay at this hotel again and do recommend it if you are flying in or out of Auckland. 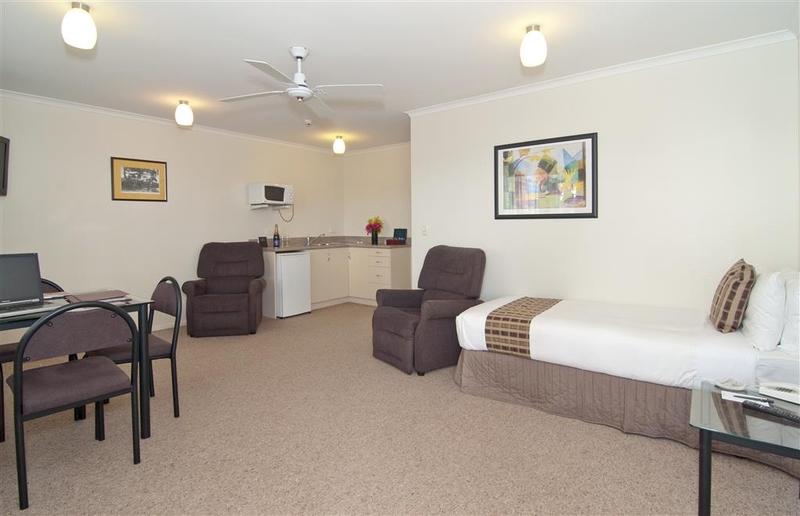 This Motor Lodge is located close to Auckland Airport. The room I stayed in was large with a very clean bathroom, and a very comfortable bed. The staff were welcoming and willing to assist with anything you needed. They offer a wonderful shuttle service to and from the airport. I was able to leave my car in a free car parking space for the 7 days I was away. I would definitely stay here again. Upon arrivsl, the reception lady was welcoming and very pleasent. Large size room with most ammenities, car parking at the door. Free airport shuttle service. A bit pricy, but about average for near tge airport. Will stay again next trip. A handy location to Auckland International Airport with free parking for 10 days & $7 per day thereafter.The airport shuttle driver & Ramesh the owner are helpful & friendly.Road works outside are almost complete so make access a lot easier. "Great motel and close to airport"
"Handy for those late/early flights"
Pretty ordinary, but clean and comfortable. Excellent location and very handy for those late night arrivals or early morning departures. Shuttle available and 24 hour reception. Friendly helpful staff. We have previously stayed and it was good so expected the same again. We were in a ground floor unit near the office. It was extremely noisy. Every time someone in the unit above us moved it amplified into our unit as though there were a herd of elephants having a dance party. There was maintenance with banging and talking directly outside our unit till around 9pm at night. With the noise from upstairs and outside it was really unpleasant. Beds were too firm for our liking and the sheets were threadbare on one bed. Disappointing as our last stay was good. A big plus is it is close to the airport and there is a free shuttle should you need one. "CLose to airport yet quiet." Location to airport is perfect yet quiet. The rooms are very spacious and clean. There are recliner armchairs in the room which is a first for me to see. The kitchen was well equipped. The staff were friendly and helpful. No lift if you are on the second floor, that was fine with me but if you have mobility issues, ask for the ground floor. I don't like writing reviews that aren't flattering but I feel travellers should be aware of our experience. Our room was on the ground floor close to reception, the stairwell and the busy road. Firstly the walls are paper thin and we could hear both rooms (tVs and guests talking) either side and what sounded like elephants above us. Every guest that checked in or went up the stairs, walked past our room so we heard endless rolly cases, footsteps and chattering until well past midnight. The car park was full with only a few free bays outside our room, so add people going out for dinner and returning and more chatter and car doors slamming it was anything but the quiet night we had been hoping for. At one stage it sounded like people were actually in our room. No sooner had we finally got to sleep when the trucks and car noises on the main road started their morning run. As for our room, it was dated, tired and in need of maintenance. We were in awe of our microwave shelf being tied together with a piece of string! The curtains were in serious need of an update. They were thin and not fitting properly which was evident as the outside lights were left on all night , which consequently meant our room was half lit all night. The bed and pillows in particular were the most uncomfortable we had ever experienced. We were given the disabled unit which meant the bathroom became a swimming pool after the first shower. The shower curtain was not long enough so the floor flooded and further trips to the toilet or basin were a paddling affair. Had we been told when booking that the only room available was a disabled room we would not have booked. We were given 500gb of data free but there was no fear of us using that amount as it kept disconnecting and we had to keep logging back in. After about the 10th time we gave up. This was annoying for us but would be a major issue for a business traveller. All in all a very dissapointing stay. I did request a quiet upstairs room as all we wanted was a good nights sleep before flying out. That being said, our room location was only a small factor in our dissapointing stay. I find it hard to believe this motel gets such good reviews as we couldn't find anything positive about our stay. I assume our rooms's decor, furnishings and condition was a reflection of other rooms in the motel. If this is acceptable and warrants a 5 or 4 star rating from other reviewers, then you need to travel more. I think the fact that guests can leave a car at the motel free of charge while they are overseas, and the free shuttle service are a major drawcard, If you don't want to use these services then I would certainly be looking at somewhere else to stay. 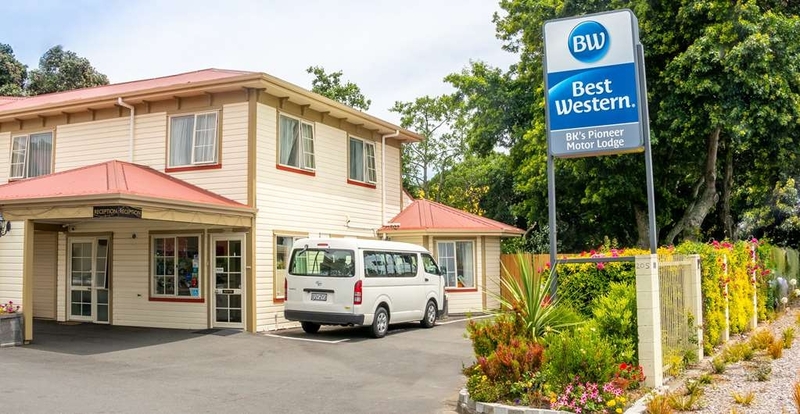 "Very good Auckland airport accommodation"
BK's Best Western is a very good place to choose to stay when you need to (a) park your car and (b) get to the airport. They offer complimentary car parking (we were away for 11 nights recently) and they also offer complimentary shuttle transfers. 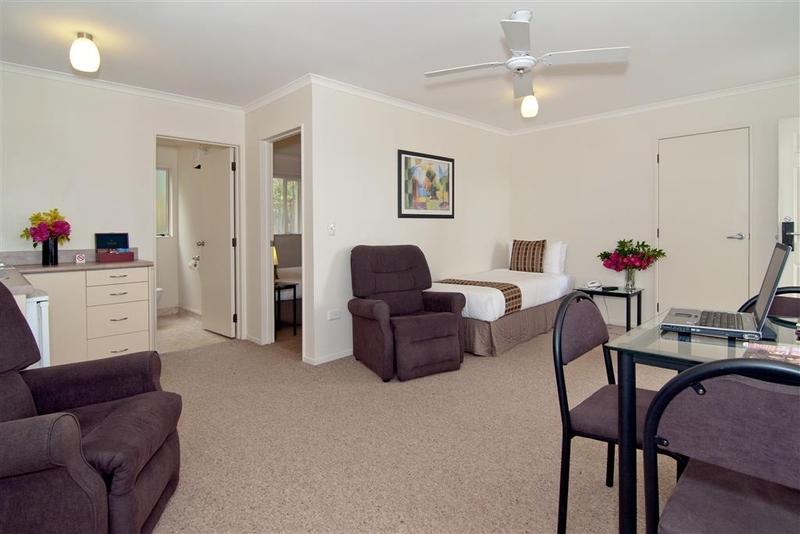 The motel room is very clean and tidy and offers everything one needs for a one night stay. The communication by BK's starts from when you first book until after your stay - they are very good at it. We would certainly choose BKs again. "GREAT OVERNIGHT READY FOR AIRPORT"
Really good stay here. comfortable. Was a bonus that our car could stay whilst we went to sydney for the weekend at no extra charge. We were also able to use free shuttle service fromthe hotel to the airport. Cant fault it. Super handy to the airport for an early AM departure the next day. Staff very friendly. It was a cold night and our room was quite cold. Space heaters helped some. All in all acceptable for what we needed but not the most comfortable place we have ever stayed. "Good Lodging - Good Location - Friendly Staff"
We chose this motel because it was close to the airport for our morning flight. The location is good. Restaurants are just across the street. And the Auckland tour bus stops next door at the Holiday Inn. We spent 2 nights here. We stayed here for one night in a 2 bedroom family unit. We found this unit very clean and comfortable. The parking was not good, cars are parked everywhere. There was a lot of road noise from our unit. It is very convenient if you have an early flight to catch as it is only 10 mins away from the airport. Another positive is that they run a shuttle bus to and from the airport. "Perfect For A Stopover "
We stayed for one night on a stopover. Room was good but be weary that 2 twin beds means 2 single beds. Loved the recliner chairs as we simply wanted to relax. Bit noisy as our room was close to the main road. Great customer service and the free 24/7 shuttle from and to the airport was a real bonus. Hotel rates good for area, staff extremely helpfull. Appartment well layed out and well stocked with essentials for cooking. Appartment clean, internet free, fast and reliable. Hotel provides free pick up and delivery back to airport which excellent. We stayed 1 night prior to catching an early international flight the next morning. The free shuttle to the airport is great, this is a good service and they arrived to collect us within 15 minutes of phoning. The bed, pillows and sheets were awful! We got about 2 hours sleep as the bed and pillows were incredibly hard and uncomfortable. The sheets were extremely noisy! Spacious bathroom however, we were in a disabled room and the floor/bath mat got VERY wet even with the curtain pulled. Probably wouldn't stay here again. "Just for sleep if you take the morning flight"
Booked for three for one night. Arrived around 8pm with a room on the ground floor arranged. Staffs at the counter are nice. Parking space limited, no free breakfast, limited free wifi. Room big enough for three, but look a little bit old. Bathroom big, spa available but not good to have shower at the same place. Besides, no convenience store around. Otherwise, it is ok to stay if you will take the morning flight. "Lovely staff and close to the airport"
BKs is a very convenient motel to stay at if you are leaving from Auckland Airport. They allow you to leave your car there for 2 weeks (longer and you pay). They have a great shuttle service to the airport and helpful staff. Rooms are good sized and clean. We were impressed by this motel. The staff were very helpful and friendly and our unit was spotless and comfortable. Of six motels and hotels we've tried in the Auckland Airport area I rate this motel highest in these respects. However, its location does mean there is road noise until after midnight. It's fantastic that you can leave your car here for up to 14 days at no extra cost. Somehow a window in our car was left partially open when our car was moved during our absence but the staff gave us a towel to deal with rain that came in. We stayed here after getting off an international flight, and had hoped to fall straight into bed and sleep. Unfortunately we arrived early morning and the very cheerful cleaning staff were happily going about their daily cleaning tasks with their supply store right outside our room! This meant we had people coming and going, calling out to each other, laughing and chatting. It was normal noise, but so not what we wanted! If you are checking in for an early morning sleep, request a quiet room away from the road and the cleaning store. Everything was good about this hotel, the staff were great, the room was well furnished the service was spot on and the location right near the airport. Shuttle was ready exactly on time. I will definitely stay there again . Anyone giving a high rating hasn't stayed in luxury hotels. This is 2 star motel. It comprises an old and a newer building, set at angles to form a triangle with the highway. Parking is within the triangle. I tried rooms in both buildings over 2 nights and could hear the traffic in both. I could also hear my neighbours and footfall from above. Clean looking rooms, albeit Spartan. Mine smelled strongly of ant killer & I learned they'd had an ant problem. I was more concerned about the toxicity of the chemicals. The aircon is above the bed - a sure way to get a chill while asleep. One room had a 2 burner Stove top but inadequate pans & crockery. The other had no stove top & I was given a greasy one plate burner and a gigantic, greasy plug in pan. The recliner in the newer room was OK, the other was worn & sagged. "Handy, popular, better than I expected"
I needed a motel in this area for business for several days. The unit was clean, and beds were good. I did like the comfy lazyboy chairs. There were a few quirky things. It appeared the original fridge had been replaced with a small bar fridge. As fridge space was one of the reasons I wanted to stay in a motel rather than a hotel this was a bit annoying. Also, there were some odd instructions about showing with a closed door so as to not set off fire alarms. First time I have seen that in many, many motels. Given the busy intersection nearby, and that the motel appeared to be jam-packed every night my unit was surprisingly quiet. My short interactions with staff were polite and efficient. I did not do breakfast so can't comment on that service, if available. Free wifi was available. Would I stay there again? Yes, but was a little off put by the cramped nature of the car parking. You certainly couldn't take a car trailer. I might not stay there in summer as there us no AC in the units. I stayed here for 5 nights while away for work. The room was beautiful and not outdated. Everything was clean and tidy. The employees are very friendly and happy to have a chat to recommend their favourite spots. It is off a busy road but the street noise is almost. The breakfasts are good sizes and taste like real food. I would definitely stay here again whether personal or business. "Close enough to the Airport"
This is a family run hotel, close enough to the airport with a complimentary shuttle bus. The rooms are certainly dated but have all the requirements for a quick one night stopover. On a positive note the service is friendly and accommodating. "Clean, basic and good value"
As per the title. Clean, good value for your buck and handy for the airport. Phoned from baggage carousel and was collected in 20 minutes. Loads of roadworks going on but that can't be helped. Pharmacy, restaurants, liquor store and grocery store within 5 minutes walk. If this hotel had decent shower pans and a little better internet experience it would get 5 stars from me. The internet is free, and they give you a paper with a code, but it has 500MB and every morning it claimed that the limit had been reached. It's less than 10min from the airport, and it's close to a small set of restaurant/markets, but there is a lot of construction going on and crossing the roads in the area is not very safe. The beds were comfortable. We were interrupted a few times the first morning by management seeking to repair the TV which turned out to work fine. They did not notice a burned out light, and I forgot to tell them. This is a family run motel, close to the airport. They offer free pickup and drop off at the airport if you call them when you arrive at Auckland airport. Despite what they said on the phone when we arrived and having called them earlier to inform them of the time they arrived more than 30 mins late. Basic room with a small kitchenette. You can pay for breakfast here, $15 or $20. Bathroom has spa jet bath tub. Wi-Fi is not great, it is really a night stay before you leave for your flight the next day. Walls are quite thin. We can hear all the neighbouring rooms beside and on the floor above us. "One night Stop over after flight to Auckland from Cairns"
If you didn't have Sat Nav you would have difficulty finding it. The room is as basic as you can get. Shower room . Uncomfortable bed. Time the mattress was changed !! No air conditioning!! and it was so hot. If you opened the windows it was too noisy. Small kitchenette area. No where on site to get food or drink, nearest place is across a busy road with lots of road works on it. Free WiFi. Clean. We finished our trip near the the BW. We got a large air conditioned ground floor room that was clean and had a good bed. Check in was fast and the receptionist was very helpful. The one issue I have is the wifi keeps disconnecting and you have to log in again after just a couple of minutes of inactivity. Like most reviews, clean comfortable room and beds, good size spa bath and the3 free shuttle to the airport is great...it works both ways so even if you are not staying at BK the day you arrive back to NZ, they still pick you up and bring you back to your car. Would definaely stay here again...its a liitle on the high side price wise, but really take off $35 or so being car parking for say 10 days at the airport. Keep up the good work..Sena ( I think?) in the office was very pleasant and helpful. Sorry about the dropped cup of coffee the morning we left!! "Nice place for a night near the airport"
I just needed a spot to hang during my long layover between my domestic and international flights. The gentleman who picked me up at the airport was so friendly. He helped me upstairs with my luggage and made a good suggestion for a place for dinner within walking distance. The shower was good, the bed was comfortable and I had plenty of space to rearrange my things in my various suitcases. There was a mini fridge and a microwave and a nice jetted tub. I would definitely stay there again before or after a flight. "Good clean & safe hotel"
We stayed here twice over the span of a week. the hotel is clean and the shuttle service makes it feel right next to the airport, would stay here again on our next trip. Staff very helpful, even helping us get a small bit to eat late at night. "Close to airport - free shuttle"
Clean, quiet at night, busy intersection at this date with road construction during the day. Staff very pleasant and helpful, rooms with microwave stove top and small fridge. Free shuttle and, limited free wifi. Unfortunately they do not have air conditioning which was fine for our stay late March as evening cooled down, would be very unpleasant even with fans in the heat of summer. Holiday Inn next door had excellent eating facilities, small mall close by for some things, price was right, room spacious and clean and large bathroom, just beware of the time of year! "Stay over for Auckland Concert"
Have stayed here about a year before. The friendly owners seem to be investing in making improvements to this Motor Lodge. The double room was comfortable and warm with a large spa bath with shower within. Slightly noisey with traffic as it's on a main road but not too bad. Travelled to Mt Smart, drive to Ellerslie Metro where parking was easy and travelled to Penrose with an easy walk to stadium. "Value, plus a pleasant stay for layover before returning home"
Booked this property months in advance for our layover before returning home. Was able to capture a great rate, but I'm guessing you need to book early to get best rates, as the "No Vacancy" sign was on upon check-in and check-out. Nothing fancy, but rooms were more than adequate for our stay and very clean. Bed was very comfortable. Shower was very strong and plenty of hot water. Staff was very helpful. Free shuttle to and from airport was important and a bonus. About 5 mins from airport. Free internet available. Easy walk to local restaurants, but make sure you get clear directions or use your smartphone map. There was lots of street road construction and traffic can be busy at times so look before you cross street. Noise not an issue at all in the room. If on a budget, or not, this is a good choice for a short or even a somewhat longer stay. We had dinner at the Bar and Baa; an easy 5 min walk from hotel. Menu available at hotel reception. Our meals were VG and service was friendly. It's located in a small strip center with grocery and at least one other restaurant with Chinese food on the menu. The property does offer breakfast choices delivered to your room, but we chose to go to the airport early and have breakfast there. Lots of food choices at the airport. "Convenient for Auckland Airport but adjoins major roadworks"
We chose this because we had an early flight the next day. The rooms are clean, and we could nearly park outside our ground floor room (despite the advertising, clearly not possible if you are on the first floor!). There are MAJOR ROADWORKS all around Auckland Airport, affecting both International and Domestic terminals, and directly outside this motel. These are due to carry on for many more months, well into 2017. The website says that there are 24h airport transfers but when we asked if we could have one the reception staff basically said no. When we asked for local restaurants for dinner we were referred to the Holiday Inn next door so we picked our way over dug up road and pavement to reach it. It took an extra 20 minutes to reach to Terminal the next day as the usually heavy traffic was corralled into narrower roads. The hotel is a basic hotel. Room was clean and comfortable. Had a jetted tub. I chose the hotel because it has a free airport shuttle. Staff was friendly and helpful. The hotel does not have dinning facilities but there are a few choices within walking distance to the hotel. very satisfied with everything including the free airport shuttle service at 3.30 am.The rooms are large and very comfortable.One of our couples required two beds because one of them had a nasty cold and would have kept his wife awake all night. The staff went out of their way to put another beds in the room. "Wouldn't Stay Here Unless Absolutely Necessary"
I'll start with the good.... close to the airport and I was only staying for 9 hours. Plenty of TV channels. Complimentary airport shuttle. Now the not so good... My room was very small, dark with very basic furniture. The walls were so thin you can hear people and the tv from the room above and next door. Honestly, it looked like one of those shady motels with shady characters you see on the TV show COPS. I didn't feel very safe staying here. I must have killed a spider, a moth and a beatle in the bathroom. There is no place to eat on-site. I walked a couple of blocks and found a variety store and a bakery. We stayed here for one night prior to flying home the next day. We had an upstairs room which was clean and comfortable. The wifi wasn't great, it kept dropping out, and the power did go off for a short time, but it wasn't a big issue. The car park is very crowded (I'm sure some people have no idea what the white lines are for!) and the roadworks looked messy but wasn't noisy. After reading reviews on TA for the restaurant across the road, we decided to walk the 1 km or so to the Carl's Jr instead. The motel is very convenient to the rental car drop-offs and the airport. Very Friendly Staff and a very clean environment and spacious.... The owner was very helpful to ferry us to and fro from the airport. He also recommended us to try the Indian Restaurant nearby for their lamb kebab which we enjoyed very much. There was also the bakery next door which had a wide selections for us and we also enjoyed sitting outside enjoying our breakfast with fresh air. "Good value and very convenient"
This motel is extremely convenient in its location to Auckland Airport, and I would certainly stay there again. The price is very reasonable, my room was spotlessly clean and had everything I needed for an overnight stay, and the management were very kind and helpful. There is no restaurant at this motel, but the Holiday Inn has a restaurant and is located directly behind the Best Western, or you have other dining options just a short five minute walk from the motel in the form of chinese and indian cuisine. So, it has everything you need for an overnight stay. I would recommend this motel mostly because it is so very reasonably priced compared to others in the area, and still offers cleanliness, comfort and convenience. "Good Place Close to airport"
We stayed prior to an early departure from Auckland airport. The motel is close to and convenient to the airport via the hotel shuttle.. The rooms were large and well equipped and the bathroom had a spa tub. There are a few fast foods outlets within walking distance. There are a lot of road works close by which made it a bit awkward to get into the car park but these were no trouble at night. "Old style motel, good location"
A very busy place with a shuttle service to the airport and free car storage. The rooms are fine but no frills.Staff and pleasant and efficient. Food is available next door. the exterior is monitored from reception with several cameras. Arrived in Auckland airport in the late afternoon. Went to the 'I Site' (a tourist information store) and found Best Western's contact number easily. Less than 10 minutes after calling the motel, our group of four were picked up by the motel MPV and driven there free of charge. Best Western is just around 10 to 15 minutes drive from the airport. The motel itself is a neat little place although the surrounding is more like a cargo warehouse area. Our one-bedroom unit sleeps four comfortably, has everything we need and is very clean. The motel owners are friendly and helpful, but unfortunately I did not meet them when I got into the reception that day. The guy at the counter was probably an employee. He was not welcoming, rather curt and just gave me the keys and told me which staircase to use to get to the room. No enthusiasm whatsoever. Located an easy 5 minutes walk away is a cluster of eateries and a mini market. We had a satisfying dinner at the Bar and Baa, and was impressed by the friendly service there. The next morning, the service at the reception was quite different - friendly and helpful. The owner actually offered to fetch us to the car rental depot when they were late to pick us up from the motel. Overall, Best Western was a nice start for us although later we realised that their pricing was not as competitive as those outside of Auckland. I suppose that's to be expected. We needed a night before our flight and I did not want to pay some of the expensive prices other hotels were offering. I found BK's and was not disappointed. The prices are reasonable and inc carparking up to 12 or 14 days for free - very beneficial. They have a courtesy van that drops you off and picks you up from the airport. Staff are friendly, rooms are spacious and clean. Wifi is included in the price. The only down side is the construction out the front of the motel - made driving a little tricky but we didn't hear any noise from our room. Would recommend this place to travelers. we had a good stay here. the hotel is located on a busy intersection but the noise is not bad. it is a 5 minute walk to shops and restaurants. I'd stay here again. the rooms were spacious and comfortable. I cant speak more highly of this hotel. It was spotlessly clean and very comfortable. The staff were exceptionally pleasant and helpful and I will never again look for a hotel in Auckland. This is it! Fourth stay at this establishment. No discount as a returning customer like I got last time. However, I didn't ask and nor was it offered. I think last time I got 5% off. Did get room 828 again though which is my room of choice at this Motor Lodge. If for no other reason...the spa is awesome. Bed is comfy. Very dark, nice and warm, slept very well. The shower is all kinds of awesome too. Fine droplets that dry off really easily. Ordered Dominos for dinner. This comes from the Mangere store. I wouldn't bother. Third great stay I've had here. Friendly hosts. Great location. Free WiFi. More free long term parking than other places. Free drop off /pick up shuttle. Handy to a great resturant, Bar and Baa, down the road. Wouldn't stay anywhere else when flying into or out of Auckland and need a place to stay. Highly recommended it. "Not a 4 star "
Extremely unreasonable price - $170 for a one night stay at a 'supposedly' 4 star motel. Even had to pay extra for a double room, which we refused to do. The room was extremely dated and the bathroom was old, grotty with a very smelly drainpipe (got given the disabled room). Only one body wash and shampoo for 2 people in a $170 room??? Stayed in rooms half the price which were 100 times better. Advertised free wifi which in fact was limited and you get given 500mb, but our slip only had 250mb! Reception lady was extremely reluctant to give more. Airport shuttle was good, however pick up was 45minutes late. Overall definitely not a 4 star motel and would not recommend to anyone. This booking suited us fine after a midnight arrival. Shuttle pleasant and helpful. Great for fly in and out purposes. Traffic can be noisy but its understandable with location on main road and highway improvements at the present. The Moteliers are always friendly and helpful. "Nice clean rooms, but a little noise from the road." Stayed in Auckland after arriving late in the day, nice clean comfortable room, but road noise was noticable and maybe not for light sleepers. Late check out worked well to help refresh me. Recommended! I thought the service was very good. The management was very helpful. I Was picked up from the airport at 11.00pm at night and taken back at 6.00am for an early flight. My room was clean and the bed was comfortable. I would be happy to stay here again. Reception on arrival was efficient, but lacked welcoming warmth. Details were largely limited to room location, airport shuttle requirement, breakfast requirements and internet provision. This may of course be due to an expectation that guests for this Motor Lodge were more likely to be transient, given its locality close to the airport, but at some distance from the CBD. Lack of additional information was also exacerbated by the lack of a guest compendium in the rooms. Room itself was a simple but spacious studio unit, which was very adequately furnished. This included two Lay-z-boy chairs, and a large comfortable bed. Bathroom was equally large, and had a very good-sized spa bath in which one could luxuriate for a time. Good strength free Wi-Fi is also available. Shuttle service is inadequate, as the driver only allows at his convenience. (Young driver). We have stayed there before & the older gentleman always serviced at customers convenience. Waiting in freezing cold at airport for 15mins to be picked up was inconsiderate & another time, waiting for driver to drop off at his convenience is a joke. "Good motel for international flights"
The motel is conveniently located for flights in and out of Auckland airport. We left our car there at no charge and they gave us a free shuttle trip to the airport and picked us up when we returned. The rooms are surprisingly quiet considering the never-ending road works along Kirkbride Road. The room was spotless though the electric blanket on the bed had not been repositioned for quite some time and had migrated. The hosts were very friendly and we will be returning soon. "Not great but good location to airport"
We stayed overnight before flying out to Brisbane. The rooms were comfortable, spacious and clean. The hosts were lovely, very friendly and helpful and the early morning wake up call and shuttle service to and from the airport was fantastic. Also being able to leave our vehicle in a safe place while away was a load off our minds - making our holiday more enjoyable. There are good restaurants within walking distance also. Recommend to anyone considering staying here and will definitely stay again. "Good stop over hotel "
With free shuttle to the airport this hotel is a perfect stop over. Was clean and beds were comfy, shower strong and hot and even had a little kitchen with hob,microwave & fridge . Not the most modern but more than adequate for a night or two. Our room had a double bed then the lounge area had a double & a single bed in to and was very roomy. Staff were very friendly. "OK Place for Near the Airport"
We had a 7:00 AM flight out of Auckland. This is a decent place to stay if you want to be near the airport. It's clean and sufficiently quiet and sufficiently well-run. If you're looking for posh, this is not the place for you. If you want to get the job done sufficiently well, this place covers that. I am mobility challenged and have a restricted diet. We ordered delivery dinner from one of the restaurants nearby recommended by the hotel. This took about 2 hours and multiple calls to the restaurant to find out what was taking so long. If you are able to walk to a restaurant, do. The food was just OK, but I would have eaten anything by the time it arrived. I stayed over night at this hotel between flight in and of Aukland. so I chose it due to the shuttle service to and from the airpot, which arrived promptly after calling for pick up. As I arrived night spent most of my time sleeping and left early I had very little interaction with the staff or facilities. 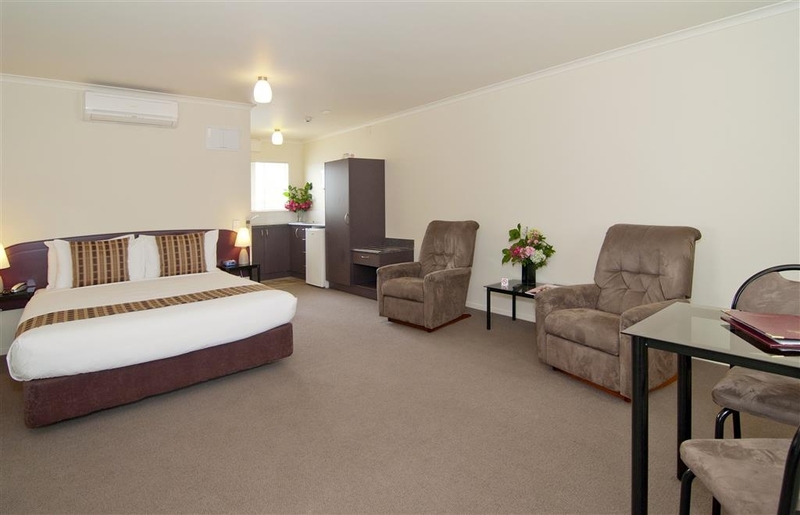 BKs is our preferred choice of accommodation when travelling from Auckland Airport. Great Hosts, friendly and nothing is a bother to them. Clean, convenient, and comfortable, value for money accommodation. Close to Auckland airport. We can leave our vehicle at BKs for free for up to 2 weeks if we purchase 1 nights accommodation. Also free airport shuttle 24 hrs. This hotel books out early because it provides excellent service for air travellers. Facilities are of a good standard close to the airport & by staying here you could leave your vehicle and be shuttled to & from the airport at no additional cost. Staff are efficient & friendly. "very good, reasonably priced airport hotel with free parking"
Stayed one night with wifey before an early morning flight across the ditch. Our usual airport hotel which provided free parking with a night's stay seemed to have put up their prices so we thought we'd try BK's. We were a little nervous but for the price this place is more than fine. Check in was easy and the room was light and spacious. One note, if you have mobility issues, ensure a downstairs room as there is no lift. There's no bar/restaurant facilities but there are a decent number of options within easy walking distance. Considering the venue is on a busy main road undergoing major roadworks we were not bothered by any noise. Wifey thought the curtains could be a bit heavier as the room was a bit light, but I didnt have a problem. The shuttle to the airport was quick and easy and the driver courteous. Because its a smaller hotel there's less other people to wait for too. When we arrived back after a week, a free call to the hotel and the shuttle was picking us up in decent time. In summary its all you really need for a night's accommodation and free parking near the airport. Close to airport. Enjoyed the shuttle service to the airport.Rooms were clean and very comfortable. Good kitchen with a few restaurant hasndy walk away. Staff are very helpful. Look forward to my next visit. Highly recommend to others. Only stayed for a night as my sister was going back to uk. Shuttle was good and even let me use it to return from the airport for my car. Friendly staff and had continental breakfast and it was as much as you needed to eat. Will use it again when we are down this way. Good value and clean and comfortable. Thank you. "2nd BK we have stayed in"
No air con , ceiling fan and stand alone fan. No heating except for a very small blow heater in the wardrobe. Parking ok but a bit tight. Close to the airport a redeeming feature. Not many restaraunts around. Limited wi fi 500mb, mean I think. Shuttle bus to airport if they can fit you in , better to make your own arrangements I think. "Nightmare stay with rude staff"
"Comfy quiet and close to airport"
Arriving late in day and leaving early in the morning we were looking for accommodation near the airport. Clean, quiet and comfortable and while they do not have a restaurant they are close to several restaurants and takeaway options and delivered a great breakfast this morning. Also offer a shuttle service to and from the airport. All good! "Dirty carpet, dirty room fan, hair belonging to someone else on bathroom floor, dirty doors and paintwork, broken shower"
A very roomy 2 bed apartment which is close to the airport. Unfortunately dirty stained carpets, doors and fans. Communal external hallways were carpeted along with external stairs were carpeted which was very strange and obviously dirty with debris etc. strange thing to do. On busy road with roadworks as well means it is quite noisy. Comfortable beds with clean sheets. "Excellent Location and Courtesy Shuttle"
This is the perfect solution for a one night stay close to the Auckland airport. The service is excellent and friendly and the hotel is good value. We would definitely stay here again next time we are in New Zealand. ".5 star hotel, not as reviews show!" Don't stay here. I don't know how this hotel has good reviews. The family that runs it must have gotten all their friends and family to write the reviews. It is less than a one star and DIRTY! There were pee stains on my sheets and the hotel looks as though it was once a nursing home and the room set up is for a disabled or elderly person. The shower is a hole in the floor with a curtain, the tile is dirty. The whole motel is gross. The location is not bad to airport, but with all the road construction a bit hard to find. "cleaning service not the best this time"
We have stayed here twice before and were more than happy with it. We turned up Saturday about 6pm and they had one room left. There was no face cloth so went to the office to get some. Noticed that night, 4 pillows on bed, 2 had pillow cases, other 2 none and one had hair on it. the bedside tables were covered in dust, wrote my name! Complained about it the next day with the comment I was paying $180 a night, it should be spotless. The next night returned from a day out to find i was unable to get in with the swipe card. Over to the office again, they reset the card and that was ok. Went into the room and everything was lovely but still no facecloths. Back to the Office again to get some. Sorry was not impressed this time having to go back and forth and paying that amount it should be spot on. Unfortunately on Sunday night, road works started at 9pm and carried on all night so no sleep. Could have been warned. We only had a short stay over in Auckland but the rooms were lovely, very clean with plunger coffee supplied ( for the caffiene addicts). The managers were very pleasant and helpful. Close to places to eat and a small grocer and liquor shops Only one small thing is we were on the bottom floor and had a stomper above us which was slightly annoying but did not change the fact that this is a nice play to stay! "Perfect location to Waikeraka Park. Quick to and from"
"not up to BW standards"
It was just a room. Pillows were hard. Room needed upgrading. The area was noisy and the walls paper thin. We were woken three times by people talking in room beside us. Parking was free but limited to a very small area. This is not a high end place, but it is close to the airport, clean and priced competitively. They do have a shuttle to the airport, which is convenient. The bathroom has an open- european type shower that is only curtained off, but it works. The rooms are nothing fancy, but it is clean. After making a mistake in a booking for another motel, we found this one. We were greeted very nicely. Our room was absolutely spotless. Only problem was Auckland weather - very humid and no air conditioning! There were two fans - one stand alone and the other over the bed, so we were relatively comfortable. The room was spacious, bed was lovely, and there were two comfy recliner chairs. We've stayed at a BK before in New Plymouth and would definitely stay here (and there) again. We stayed for just one night, very friendly, we were picked up from the airport quickly after we rang, and dropped of the next morning.Our room was very clean and comfortable. Down side, the person who was staying on the floor above us, walked the floor ( STOMPING ) up and down from 8.30pm till midnight which made it impossible to get any sleep. Only stayed 1 night (between flights) staff were helpfull but only did the minimum, rooms were clean, spa bath was great, not really somewhere I'd stay if i had other choices (would stay again though) Restaurants in the area. "Stop over on route to Tongariro National park "
Stayed for one night! But in hindsight could have stayed on our return last night stay. First impressions can be deceiving as a lot of road improvements going on around. Our room was very spacious and clean! Loved the spa bath. When we left the next day we didn't know we'd had neighbours so very quite. Would definitely recommend from our experience. Stayed at the Pioneer Motor Lodge as the final hotel stop over before leaving to come back home to the UK. We found it very convenient for the airport. The staff were very friendly and helpful providing advice on where to eat and also making sure we didn't have any problems getting to the airport for our flights. The rooms were perfectly fine and we would stay there again without hesitation. We had a 24 hour transit in Auckland and chose this hotel due to its proximity to the airport. No regrets, it met our needs admirably. We were pleasantly surprised to see that the room we had booked actually turned out to be a clean, spacious ground level suite consisting of living area with sofas, a single bed, dinette set and a kitchenette with two ring burner, microwave, fridge, electric kettle, pots and pans, crockery cutlery and cleaning supplies. The room also had a flat screen TV and free wifi. The bed room had a queen bed and a spacious full bath. We had a very comfortable stay. The front office staff was very friendly and helpful. They provided us with free shuttle to the airport the next morning. The hotel does not have any restaurants, but there are some dining options within walking distance. The city center and harbour area is a 20 to 30 minutes drive depending on traffic and the front office arranged taxi for us to go to the city for sight seeing. Altogether the hotel met our needs adequately during our short stay in Auckland. "Very convenient for business traveller"
My wife and I had to visit Auckland at short notice for a funeral. We needed a convenient low cost motel near the Airport for one night. This hotel was a good choice. 1. They had a room available 2. We had picked up a rental car and we were able to find the motel very quickly as it was about 100 metres off the main road to the airport. 3. The room was not glamorous but very clean and tidy. 4. Furniture was basic. The bed mattress was a bit too soft. Checking in and out was very quick and courteous. 5. Not many options for a meal near by. 5 Price/performance was better than other low cost options we have used in the past at Auckland Airport. Recommendation. If you want a convenient, low cost motel near Auckland Airport for just sleeping, this is a good option for you. e.g. business traveler. 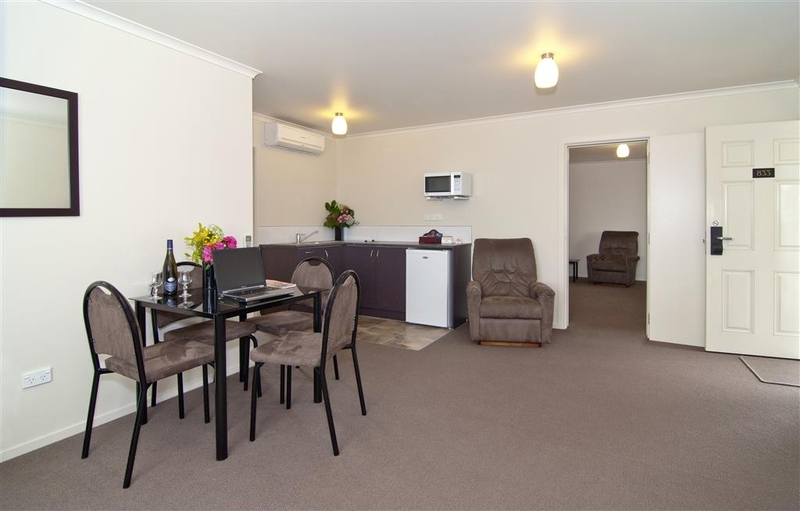 If you are a family and want to spend some hours each day at the motel, and be able to walk to shops and restaurants then this place is not great due to its basic décor and remoteness from shops and restaurants. "Great place at a great price"
My husband and I stayed a the BK Pioneer Motor lodge for a night, as we were going to a concert at Villa Maria Winery, which is not too far down the road. The hotel offered a shuttle to and from the concert. We found the staff to be very friendly and helpful and nothing was a problem or too much for them to do. The room was clean and tidy, good kitchen facilities. The price was very reasonable, especially as we had spa. I would highly recommend this hotel to anyone! Definitally will stay again!! My wife and I stayed here for one night because we had a 0900 flight the next morning on a Cathay Pacific flight to Hong Kong. We were warmly greeted at reception and checked in. Our shuttle bus requirements for the airport the following day were quickly sorted out. The shuttle was free. The room had a kitchenette, comprising microwave, two rings, fridge, coffee plunger, kettle, toaster, cutlery and utensils. There was plenty of coffee and tea. The lounge area comprised a table with four chairs, two easy chairs and two single beds. There was a separate bedroom containing a queen bed. The bathroom contained a large shower, WC and wash basin. The hotel was busy and, although noisy at first, we slept well. There are several restaurants within easy walking distance. We had a 0515 alarm call and were taken to the airport very efficiently and effectively, leaving the hotel a few minutes earlier than our designated departure time of 0555. The driver was very friendly, polite and courteous. The hotel was ideal for our requirements and we would return if we were passing through the airport again in the future. "Clean and very close to airport"
Clean and looked like freshly paint room. Not a lot of decoration but fit our needs perfectly. Walking distance to good restaurants and shopping for last minute needs. A 30-45 minute ride to CBD. Free shuttle to airport 4 KMs away. Both drivers were extremely helpful and friendly. Great place for overnight stop. Female front desk clerk was less then welcoming and somewhat rude to our entire party in person and on the phone. This is a great Hotel and close to the airport. They let us put our esky in their freezer overnight as we were bringing seafood home with us . We had an upstairs room it was lovely and clean has a kitchen if you want to cook yourself the bed was lovely and everything was clean. There is no restaurant but hotels close by to eat at. You get free wifi and free transfer to the airports. Would stay there again. "Great place for Auckland stay"
Very helpful staff for our first time in New Zealand. They stored our extra luggage when we took a few days to fly down to Christchurch. Provided excellent shuttle service to & from the airport. also, recommended the cheapest taxi service to downtown. Serves the purpose of being near Auckland airport for early flight. The rooms were clean, good laundry facilities free just pay 2.50$ for soap powder. Not much choice near by for a meal, all very basic. "great for our overnight stay near the airport"
Complimentary shuttle from the airport took about 15 mins and check in was quick and smooth. Large room, two armchairs, table and two chairs, and a fridge and microwave, with dishes and kettle. Very simple furnishings, but clean and suitable for our purposes. Staff very helpful and recommended two restaurants, offering to provide a shuttle for us, even though they were only a five minute walk. Adjacent to the restaurants is a grocery store and a beer/wine store, so everything very close. Complimentary wi-fi was very fast. Staff were friendly and helpful. Arriving to Auckland Airport late at night the motor lodge was almost impossible to find for a first time visitor with a rental car. Although it looked easy to find on a map, ongoing road construction and poor signage caused a major frustration. The room was adequate for one night only. It was just a place to sleep nothing else. The room was sparse and had a very uneasy feel to it. Also, parking was tight. Perhaps my frustration with finding the lodge tainted my review, but I would not stay again. My daughters and I stayed for a night before picking up Dad from airport. Great room, nice and roomy and very quiet. Great location and went next door for dinner. Would stay here again. Nothing wrong with the room. We were upstairs and great. "Good one night near airport"
This is a fine place for 1 night by the airport. Free shuttle provided. Rooms not fancy but are clean. There are a few restaurants within walking distance, but very limited. It is on a busy road but was quiet enough for us. We would probably stay here again but only to be near the airport. "Indifferent Staff, Room needs work"
We stayed here because it was close to the airport and we had an early flight. Check-in person was rude and indifferent, the room was really run down. Even though there was a wifi password, it did not work and no one was around to help. Location to airport is convenient, but in our experience that's about it. "Overnight Stay at BK's Pioneer Motor Lodge, Auckland"
Recently we stayed for a night at BK's Pioneer Motor Lodge, Auckland. We found that the room presentation was clean and the room it's self was in good condition. the only problems that we noted were: Bed was a bit soft. For breakfast there was no choice of cereal, corn flakes was only available. The room was at the top of the stairs and consequently a bit noisy during the night with people coming and going. Room was spacious, plenty of room to move around, even bathroom was not cramped. Would stay at this Motor Lodge again and would recommend it to friends & Relatives. "This property is close to the airport and within walking distance of a convience store and eatery." The staff were more than helpful and very friendly. We had adjoining rooms for five people. The rooms were spacious and clean. The only negative were a flight of stairs although the staff helped with the bags. Standard motel with nice staff. They are quite friendly and professional in introducing interesting visit points in Auckland. However, the ambient strong smell of curry may bring some unconfortable feeling. We stayed one night before taking someone to airport. Friendly staff. Room was spacious for 4, separate double room & clean bathroom. Good water pressure so nice shower too. Some wear & tear, so not top of range but good value for money, handy to airport, & clean & tidy. "Worst stay and motel ever!!!" My partner and I stayed here unfortunately for 4nights before I deployed for 6months. The only good thing about this place was the price which I would have happily paid a bit more to get better accommodation if I knew this was going to be such the pits. Dirty bathroom with long black hairs everywhere. Shower curtain to small for bath/shower and has broken hanger/slides. Light blew which we reported and never got fixed. Spa jets don't work properly and excreted brown stuff when turned on. Didn't change towels when asked. No sky (even though sky watch mag in room) and usb doesn't work on TV which is too small for the room. I had purchased 4nights yet had to get key card reset as it was only programmed for 1night so we were locked out with all our belongings inside (luckily reception was still open on our return). The heater is only a small desk sized fan heater. Washing machine and dryer there is only a couple for the whole place and doesn't work properly (1.5hrs for a couple of t-shirts and pants) This place claims to be 4+ stars I wouldn't give it 2 stars. It is a cheap and nasty accommodation that smells and wouldn't recommend to anyone. This place needs to have its stars reviewed as I have stayed in many hotels,motels,motor lodges, backpackers and B&Bs and even the cheapest ones have been better then this!!! ???????? very disappointed!!! 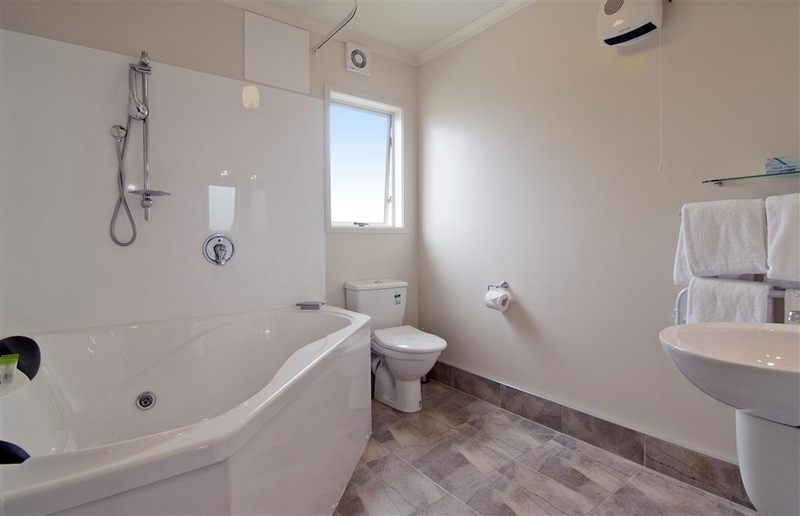 Great location, friendly staff, great parking, close to shops and airport, with a short drive to center of Auckland, and bus service outside of accommodation. Large size rooms with all that you need. Good beds. I want to thank Rukhi for his friendly and efficient service. We had an early morning flight out and needed a place to stay. The unit was very clean, units had all the necessary amenities, beds were comfortable. Very close to airport. Very happy with our stay. For an Airport motel BK's really isn't bad at all. Nice room, decent decor and close to the terminal with a shuttle for transfer. Which is good for early morning flights. This service is also 24 hours. Perfect place to stay if flying the next day, free place to store car for 14 days, shuttle to airport, food a walk down the block. Nice spacious room, quiet, clean, lovely spa pool very big was excellent, good kitchen tv. Wifi was good but didn't last whole night (might have been able to get another code though, I didn't check) Would definitely stay there again. "2nd visit and just as good"
Very clean rooms, lovely big spa bath, comfy bed and recliner chairs, free parking and very prompt drop off and pick up from the airport all at a reasonable price - just what we wanted. Visited during a cold snap and the little heater in the room warmed it up in no time so we didn't miss not having aircon in our room. Also had breakfast delivered to the room the next morning which was good and hotel were happy to provide late check out for us for a small extra charge.